I received a nice SMS from Australia Post the other day. My package from Amazon had arrived and is waiting to be picked up from my Parcel Locker. It was my new Intel NUC! I’ve been following the Intel NUC since it was first released back in late 2012. I thought it was a great little box but never had a real reason to get it. That was until a few weeks back while on a late night train ride home. I had just started a new job and realised that my current home lab just wasn’t cutting it any more. My Lenovo desktops with a huge 4 GB of memory were more trouble then they were worth. So that’s where this NUC comes into play. 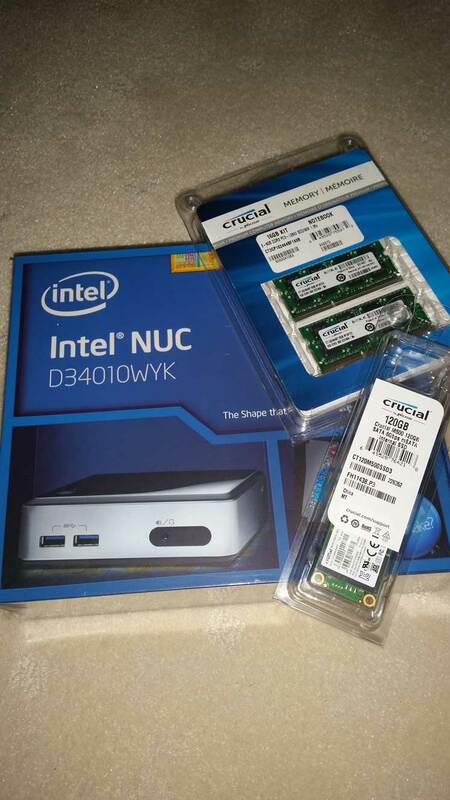 I bought the 4th Gen Intel i3 NUC with a 120GB mSATA SSD and 16 GB RAM. The specs are probably a little high for a trial, but I’m holding high hopes that things will work out. The plan is to run up the NUC as a VMware ESXi host in a couple different configurations. To be honest i’m kind of making this up as I go along. The plan is to try and run ESXi on the SSD and then off on an external USB stick. Either one of these options and I’m high fiving and well on my way to a new home lab. The ideal scenario is to get ESXi to run off a USB stick and then run Vmware vSAN off two or three NUCs down the track. Like a new family member entering the home I took some happy snaps. Sliding the NUC out of the box, below, plays the Intel Inside theme music (Scared the hell out of me). There’s a little light sensor and speaker in the corner. First things first, we follow the Ikea instructions and remove the bottom cover to expose the internals. Next we install our two 8 GB SODIMMs. Now we put it all back together and figure out what to do next. Over the coming weeks I’ll be posting how I configured the NUC and setup of a new home lab.